this kit is a bit heavey and bulky for a solo backpacker. great for kayaking though. 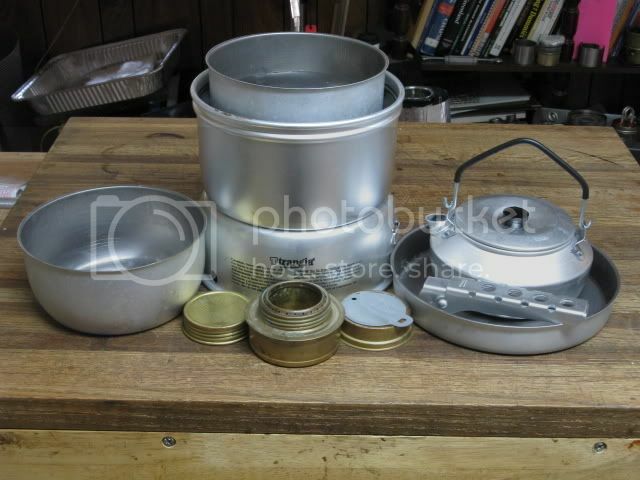 it's a -8 kit with 'Duossal' pots and pan that Trangia no longer offers. 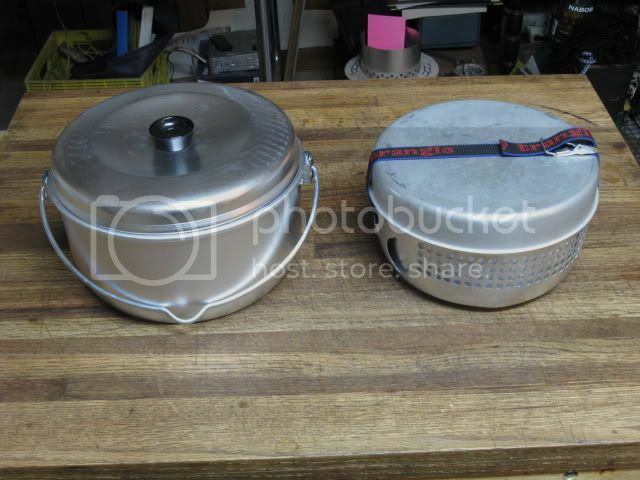 Duossal means that the pots are stainless on the inside and aluminum on the outside. the new -8 kits are hard anodized non stick or plain hard anodized aluminum. the kit all packed up, on the right, fits inside the "Billie", on the left. What is the fuel capacity and bloom time with 18ml of fuel? What is the weight and water capacity of the tea pot on the right? the kettle is 4.9oz c/w lid. max capacity is just two cups. blume time with 18ml is just seconds. i'll check max fuel cap tomorrow. max fuel capacity of the Trangia burner is 3oz. note that the burner is identical for the Mini, the #27, and the large #25. Zelph; when you destroyed that Trangia burner..... was there any insulation in it? thanks Oops. i thought they might. they have always felt just a bit heavier to me than what they should, given the amount of metal in my hand. Thanks for the information Daren. No insulation in the trangia. There is a wick material in it. I'll try to find the thread that shows the photo of it. No insulation in the trangia. There is a wick material in it. It became wickatized, didn't bite the dust.